Sunday....booooo! | Work in Progress. 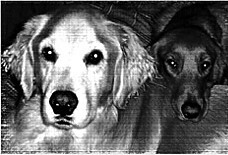 My inlaws were in town this weekend - nice to have company around the house again. It's been a while since we've had visitors. 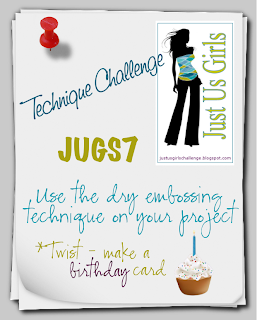 After watching my NY Jets lose to Jacksonville (not sure where the team from earlier this season has disappeared to....), I went up to my play space to make a card for one of my favorite challenge blogs, Just Us Girls. Every week of the month the challenge is a little different - Week 1 - Sketch, Week 2 - Technique, Week 3 - Color, Week 4 - 3D/Template, and Week 5 - WILD card. This week is a technique challenge - use dry embossing. As a twist, we were to make it a birthday card in honor of Dana's Birthday (Happy Birthday Dana!). Well, I didn't see the twist part originally (apparently I was SO excited to go make a card, I skipped over the part where it said to make it a birthday card), soooooo I actually made two cards. One is a birthday card; the other a wishing you well card. Thanks so much for stopping by for a look-see, folks!